Finally SystemPreferences got released. Long due it contains a series of minor corrections since the past release of 2006: Updated makefiles against gnustep make 2 series, warning fixes and compilations on older platforms like gcc 2.95. But maybe of more impact is the new Color Schemes module, written by me, which allows the setting of the color accent of GNUstep. It can select against ready made schemes and has a simple built-in editor. The schemes are compatible with backbones Preferences' application. 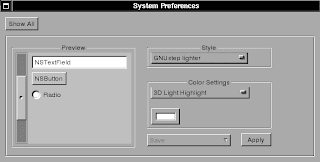 Included is for example the "GNUstep lighter" scheme which is visually very similar to the standard NeXT style colors but they are brighter: it is thought for people running their monitor with a different gamma than NeXT computers. It appears to be the majority since there were a lot of complaints about GNUstep being too dark! If you run GNUstep applications on Windows I bet you will welcome this small new detail. Thanks to the continuous dedication of Nikolaus who worked and works on SimpleWebKit, a new, pure Objective-C WWW implementation compatible with Apple's WebKit implementation. It shows once again the real power of Objective-C and the Foundation and AppKit frameworks (and also shows what kind of unnecessary kludge Apple did). Thanks to the efforts of Fred, Nikolaus himself, Gregory and me, SimpleWebKit and GNUstep AppKit evolved enough so that SWK can now display pages pretty decently, close to what the first screenshots from a mac showed. Images, links, font size, rudimentary Header and list support is there. Horizontal rules. Bakcground and Font colors. Also the DOM tree is pretty complete, so parsing is even more advanced than the display itself. 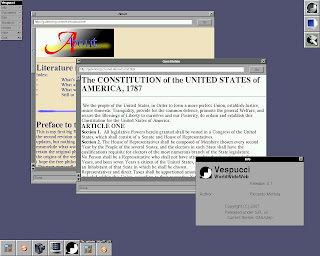 Thanks to the power of OpenStep Vespuccci already supports easily multi-window browsing. And scrolling inside the pages thanks to the scrolling of text views which Fred fixed. The way to something usable is still long. No history, no tables, many small quirks even in basic 1.0 HTML when doing formatting. But what counts is I think that an extremely big step was done. I was amazed when I saw everything working so smooth.